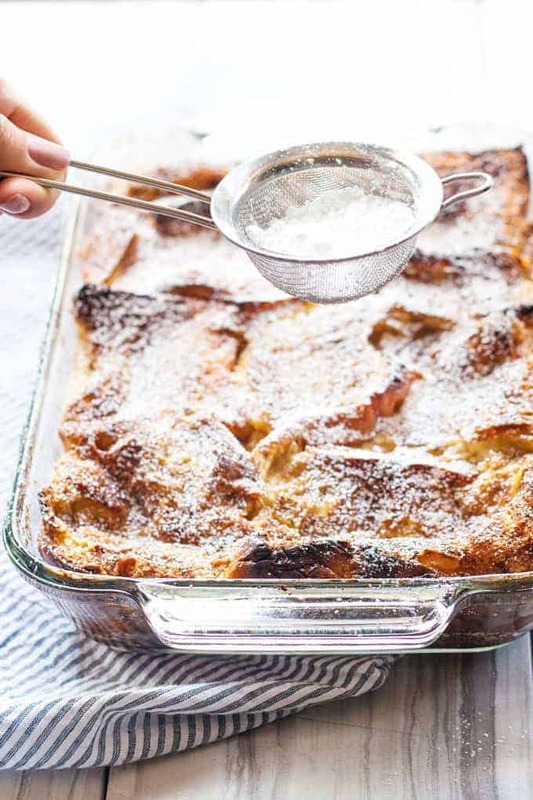 Baked vanilla French toast is the perfect lazy Sunday morning breakfast. Prep the whole dish the day before and then pop it into the oven in the morning! This post is in collaboration with Peapod and FromthePod.com. All thoughts and opinions are my own. Thank you for supporting our sponsors! 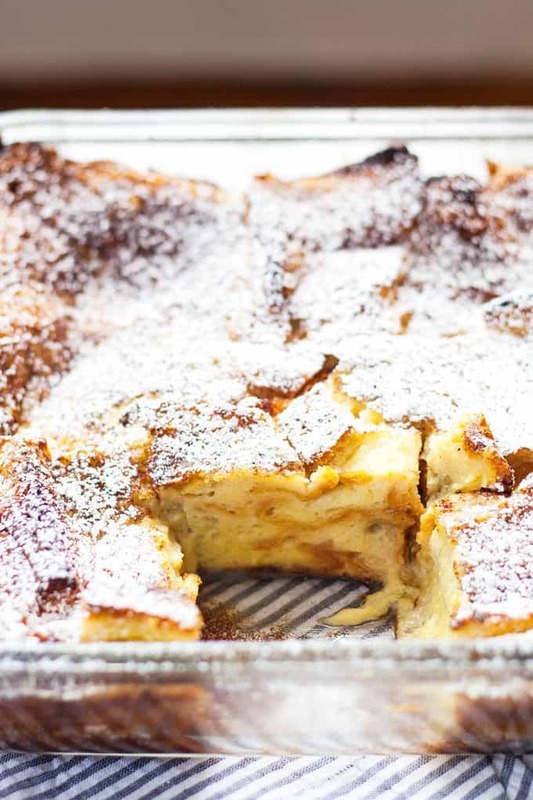 Yesterday I treated myself to a special breakfast – baked vanilla French toast. It was Sunday and all I wanted to do was sleep in so I prepped everything the day before. There is something so great about a plan-ahead meal! I knew I was going to a birthday party for one of my closest friends and would probably be out late. That doesn’t mean I don’t deserve a delicious breakfast in the morning though, right? Saturday, after I was done cleaning up my apartment and taking care of my dog (love you Nero! ), I got to prepping. I had already had all of the groceries delivered by Peapod on Friday so all I had to do was tear up some bread and whip up some eggs. I have a lot of vanilla extract so I decided to add extra to make this baked French toast full of vanilla flavor. You could also use different extracts, or even a little flavored alcohol to give this extra taste. I wanted it to be family friendly so just vanilla extract for me. I prepped everything and covered it tightly with plastic wrap, then popped into the fridge to be ready for me in the morning. When I woke up Sunday morning, all I had to do was preheat the oven and then let it bake. Lounging around while your breakfast bakes is the Sunday morning of my dreams. Thirty minutes later and my tasty French toast was ready to eat. I created this recipe as part of my partnership with Peapod and the recipe website FromthePod.com. I’m part of a group of great food bloggers creating awesome recipes and meal plans with Peapod in mind. 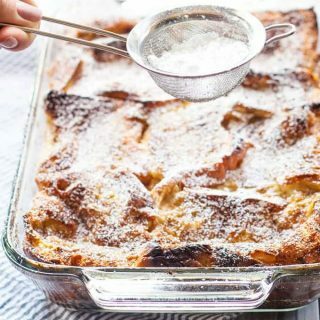 This recipe for baked vanilla french toast is part of a weekly meal plan I created. Go to FromthePod.com now for the entire meal plan. I love that you can go to any of the recipes on their website and have that recipe’s ingredients put right in your shopping cart. Then all you have to do is unselect the items you already have in your kitchen. For this recipe, head over to FromthePod.com. Place bread in two layers in the baking dish. Tightly pack the bread; if there are gaps tear pieces of the bread to fill them. 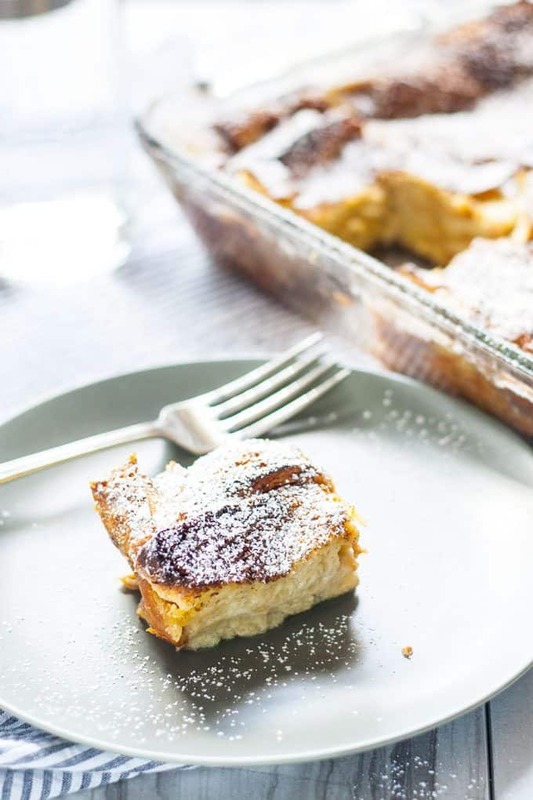 In a medium bowl, whisk the milk, eggs, 3 tablespoons sugar, salt and vanilla extract. Pour the liquid over the bread. Sprinkle with cinnamon and the remaining sugar. Wrap with plastic wrap and refrigerate overnight. The next day, preheat the oven to 425 degrees. Remove the baking pan from the oven and bake for 30 minutes or until golden. I made this for Christmas morning….the top burnt and the bottom was soggy and not thoroughly cooked. ??? ?